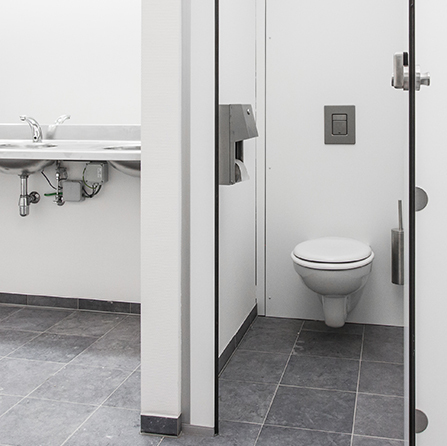 ASI Alpaco duct panels offer an elegant way to cover the unsightly plumbing in a washroom cubicle without sacrificing the flexibility needed for maintenance access. The stylish high pressure laminate (HPL) we use in our systems is antimicrobial and virtually impermeable; we can also match any of our cubicle colors to create the finished look that your washroom deserves. We produce two different options—panel systems that are demountable (removable) or ones that are not demountable (fixed to the wall) where, if desired, we could provide an access portal to reach the plumbing. In both cases we can provide coverage from floor to ceiling or create a partial height system for you. For our demountable (removable) system, the panels are attached to a frame and can be removed to give you plumbing access. For our fixed system that is not demountable, the panels are attached to a frame that is then directly attached to the wall. If requested, we can also provide an access portal that will allow you to reach the plumbing fixtures as needed. The frames we build for both duct paneling options can be constructed of wood or metal profiles depending on the environment and your preference. 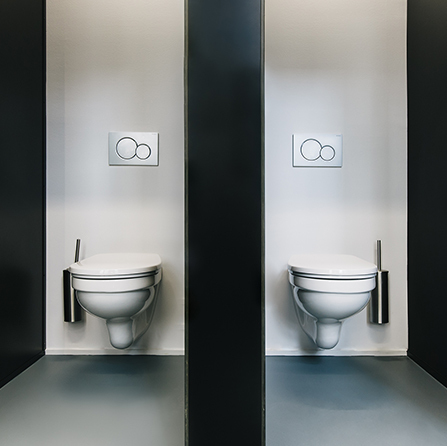 ASI Alpaco also provides duct paneling for urinals as well as for custom vanity applications so you can maintain the continuity of design throughout your facility. Our flexibility and breadth of line allows us to create visually pleasing, yet highly functional, environments. Our experience throughout Europe, the Middle East, Africa and the United States will give you the peace of mind to use our products—no matter where your design footprint reaches. Our Duct Panels are constructed of 13 mm thick High Pressure Laminate Compact (HPL), which is anti-microbial, non-porous, water resistant, impact and scratch resistant and available in a range of standard and custom colors.